Is there anything cooler than a good street musician? Unexpected notes floating on an evening breeze, like angel trumpets and devil trombones. The air is transformed into something superior, lighter, art becomes part of the fabric of the world, like it should. Is there anything more annoying than a bad street musician? A strolling violin player in an Italian restaurant – you want to hear what your companion is saying, you must pay the guy to go away. Headache – inducing cacophony at a train stop, you are trapped until your transport arrives. The talent-less kid that drags his instrument case somewhere that he shouldn’t. Which is one and which is the other? It’s more up to you than to the strummer. This entry was posted in Photography and tagged black and white. 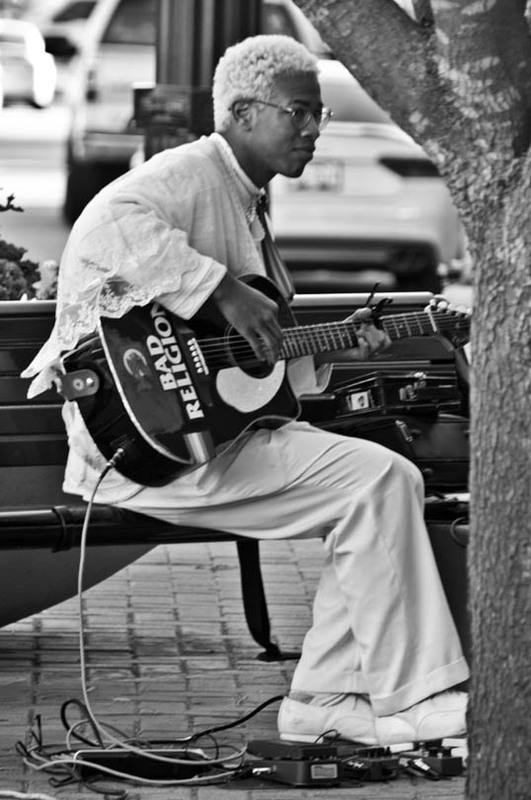 B&W, guitar, mckinney, Music, posataday2017, postaday, street, street photography, Texas, Writing. Bookmark the permalink.